BOSTON (CN) – A civic group that wants to fly a flag of a red Latin cross over Boston City Hall brought a federal complaint Friday to get its way. At the time, according to the complaint, Camp Constitution had been waiting over a month for word on its permit request to fly a Christian flag in honor of the anniversary of the signing of the U.S. Constitution on Sept. 17, 1787. Shurtleff made a similar request for an October event he branded as “Camp Constitution Christian Flag Raising.” The complaint says this request did not even get a response. Disputing the city’s claims about a policy on nonsecular flags, Camp Constitution says Boston has published no guidelines to this effect. The city has also in the past approved of flags that contain explicit religious references, according to the complaint. “Counting the [shield] dots and doubling those five in the center, there are thirty dots that represents the coins Judas received for having betrayed Christ,” the complaint states, quoting an explanation that Boston posted on its website for the Portuguese-American festival. Furthermore when Boston commemorates the Revolutionary War Battle of Bunker Hill, it flies a flag depicting a red St. George’s Cross. 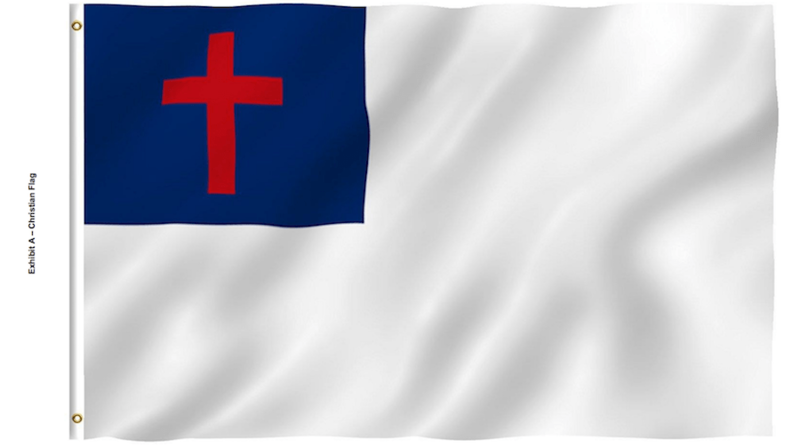 Camp Constitution notes that another Constitution Day and Citizenship Day is around the corner, and it wants an injunction so that it can raise the Christian flag this year. A representative for the Boston mayor’s press office has not responded to an email seeking comment.